Have you ever read the children's book, Nothing Ever Happens on My Block ? A boy sits on the sidewalk and complains about how exciting things happen elsewhere in the world, but nothing ever happens in his neighborhood. Meanwhile, on each page of the book, in the background, many various exciting things ARE happening. The boy is so caught up in moping and grumbling that he fails to see what is all around him. It's easy to fall into the rhythm of everyday life and fail to fully recognize the changes all around us. Sometimes, though, dramatic events shake us up and we long for the simple, humdrum, boring days. Regardless of whether the week has been boring, or filled with a little too much excitement, I always enjoy taking time to reflect on moments that have made me feel thankful. Living life through a perspective of gratitude makes both the boring times and the too-exciting times more manageable. Humans are complex creatures, and we can feel grief and gratitude simultaneously. Though my list this week focuses on my own small world, my heart aches for those affected by senseless tragedies. I imagine that I'm not the only one who feels unsure of exactly which policies would actually help prevent future shootings. I do know, however, that I can, in my own little sphere, support strong families, encourage mental health, do what I can to relieve suffering, and point out what is good. 1. I'm thankful for boring times. Every time I drive north on 1-15 (An aside to my Dad: I'm not in CA anymore, so freeways are no longer referred to as "the" number), I notice an electronic sign that tells me the time required to get to the Pleasant Grove Blvd exit and the Pioneer Crossing exit. The time (in minutes) is always the same, no matter what day or time of day I am driving. Seven minutes to Pleasant Grove Blvd, ten minutes to Pioneer Crossing. It makes me smile every time I drive by that sign. They might as well put up a green wooden sign with the minutes painted on, like the signs that tell distance in miles. 2. I'm thankful for newly-discovered plants. One of the things I love about moving to a new place is finding out that the previous owners planted bulbs. 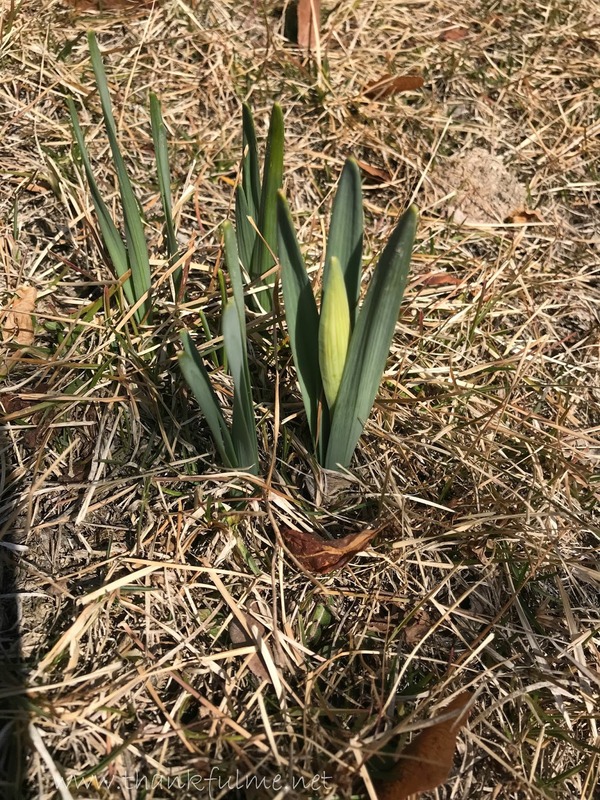 This week, I noticed daffodils popping up in the middle of the lawn at our new house. I'm curious to see if there are other bulbs that will appear later! Photo: The photo on the left shows the kitchen before remodeling. A desk is at the far left of the photo, followed by a sheet-rocked pantry, then space for a refrigerator. Going around the corner, the stove and microwave are next to a window, which marks the next corner of the room. The sink is in that corner, and cabinets follow that wall, then a peninsula juts out into the middle of the room. The photo on the right shows the design of the kitchen after the new cabinets are in. If we start at the far left, we find a build-in pantry, followed by the refrigerator. A set of drawers sits between the fridge and the stove, then cupboards run the length of the back wall to the sink. 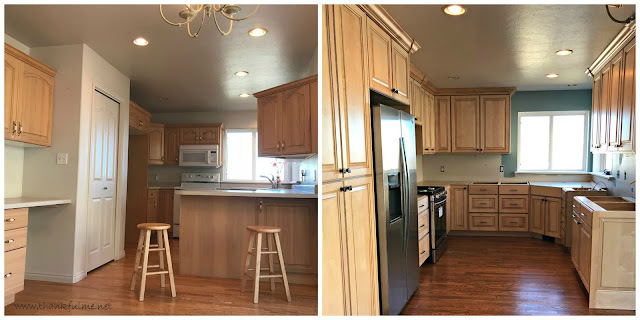 Cabinets run the length of the right wall, but the peninsula is gone. Photo: The photo on the left shows a staircase carpeted in light-brown carpet. 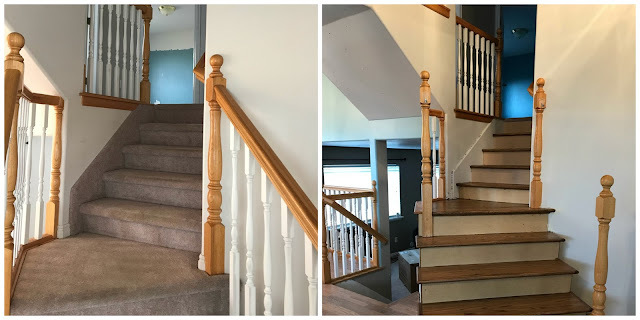 The photo on the right shows the same staircase with the carpet removed and the treads in stained oak wood. 5. I'm thankful that youngest daughter has a job. 6. I'm thankful for music, and talented musicians. John and I had the chance on Thursday night to attend a concert by Jake Shimabukuro, an amazing ukulele player. You might think you know what ukulele music sounds like, but unless you've heard Jake play, you probably can't imagine the versatility of the instrument. 8. Speaking of snow, I'm thankful that oldest daughter is in Alaska right now, having the chance to do volunteer work in a couple of villages. 9. I'm thankful for the anticipation of upcoming events. At the end of the month, my mom is coming to visit and we are attending RootsTech, a family history conference held annually in Salt Lake City. I'm looking forward to spending time with my mom, and attending the conference together. 10. As always, I am thankful for John. No matter how much chaos is swirling around in the world, peace reigns in our marriage, and for that, I am grateful. What are you thankful for this week? The link to add your own post stays open until Tuesday. If you miss that deadline, another link opens on Thursday. Come join us! Nice list of thankfuls. Your house is looking great, I love the cabinets. We have old metal ones from when the house was built in 1947. Have a great week. enjoy the progression of 'before and after' photos. Things are coming along. Funny how it's the little things, not simply less traffic, but reliable travel times between points on the highway. I'm wondering if your daffodil might be a hyacinth. I love the smell of hyacinths. This coming week, the ukulele player is doing a show here. Your #1 made me laugh. A painted wooden sign or even a metal one would probably been much cheaper too. It must be very satisfying to see the progress on the remodel. I love how the kitchen was transformed. My knees could not handle all the stairs you have, so I am thankful to have a ranch-style home. I just read your intro and want to comment now before I read your list. Well written and well-said, Kristi. When we are busy grumbling about what isn't we forget about what is. That is so applicable to everything in life, I think. I'm noticing my 90 year old mother in law is struggling with not being able to do the things that she used to do. I am reminded of Noah, the veteran who lost both an arm and a leg on the same side of his body in an explosion. When he was most frustrated he concentrated on what he could do, not what he could no longer do. Your writing inspired me to do just what this blog hop does - having gratitude for what is, not what isn't. On to read your list. Your list is lovely and I'm happy the house is coming along nicely. Love the hardwood floors and steps. The kitchen is very modern and homey at the same time. I will like seeing a picture of the bulbs in bloom. Enjoy the upcoming visit with your Mom. Thanks for the share and vid of Jake. Cool. I have a ukulele but never tried playing it. It actually hung on a wall as decoration! Congratulations to your daughter on the job. A new job, whether replacing an old one or new after not having one for awhile is a very exciting. Hope she enjoys it! Surprisingly, we had some snowfall Saturday afternoon. Pretty for a couple of hours but thankfully gone the next day. 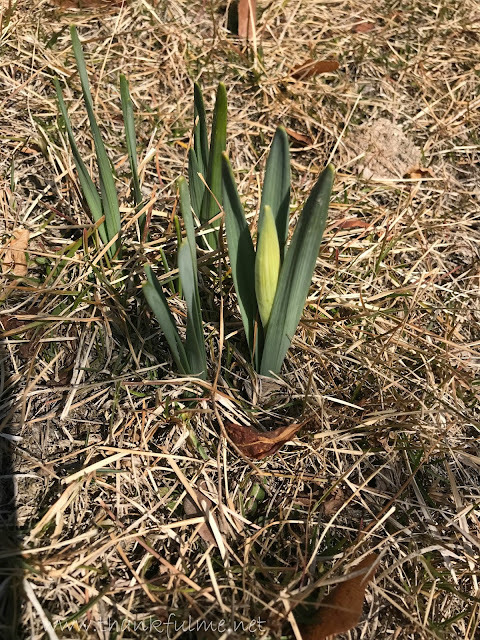 Our daffodils are at the same stage! We've had a ridiculous amount of rain already this week, and now it has changed to freezing rain, so I don't think I'll see my daffodil blooming any time soon! Boring isn't always bad. It can be safe and secure. After the horrors in Florida, a little boring was comforting. We still occasionally refer to a highway as "the" number, and we haven't lived in LA for 20 years! Your house is coming together so nicely! I'm enjoying watching the progress! Grief and gratitude felt simultaneously. So true. I love your thoughts on snow, as so many people I encounter think rain is preferable to the white stuff, in February, in Canada. It is maddening because that's not right. Bad for the planet to be so off like that. Yet, daffodils seems to be a bit of a theme this week. That conference sounds like it will be interesting. Also, that book does too. I've never heard of it but will now have to make a note to look it up and check it out. Thanks.